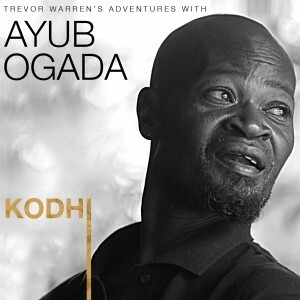 Trevor Warren visited Ayub Ogada in Kenya in the Spring of 2012 with the ambitious goal to record an album together in just two weeks. Trevor touched down in Nairobi and met up with his old friend Ayub and the Kenyan musician, Isaac Gem. The three set to work on songs for Kodhi, meaning ‘seed’ in Luo, and this grew rapidly into a fully fledged album. The much needed rain staved off at the end of the dry season, but the muse flowed readily for Ayub, Trevor and Isaac.They enjoyed the sight of wild animals of Nairobi National Park where they worked on the album with the ever present birdsong and zebras and antelopes grazing in the distance. The musical venture was interspersed with surreal outings to the city of Nairobi, with its intense heat, traffic jams, shady rum bars and huge mosquitoes. They enjoyed visits from a wide range of curious guests including UN ambassadors and the British singer, Gary Barlow. On the second week, the trio headed to to Lake Naivasha in the Rift Valley to finish the recordings and played a few impromptu gigs in local bars. The result of this fruitful collaboration is the album Kodhi. All tracks composed by Ayub Ogada/Isaac Gem/Trevor Warren Basic tracks recorded on location in and around Nairobi and in The Rift Valley, Kenya, March 2012. Eternal thanks to all involved named above and Camilla Wirseen, Prasad Velankar, Alan Donovan and the African Heritage House Nairobi, the Ross family at Fisherman’s Camp Naivasha, Alex Hall, Rob Bozas and everyone who have enabled Kodhi to grow into such a beautiful creation.